Congratulations! You've just survived 19 days without college football. 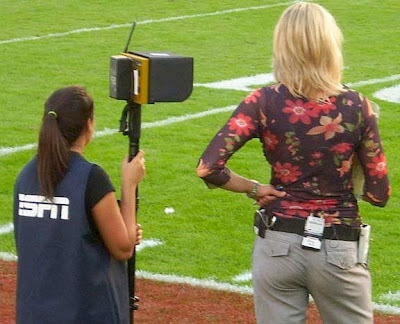 Bowl season starts tonight, and think of all the wonderful things you have to look forward to, like the return of Erin Andrews. Too bad Erin only got one bowl game to work, I believe. Thankfully college hoops is coming and those game don't require cover up with a jacket. That girl has no backside. That looks like two legs sticking out of her back.